People Will Ask, Be Ready to Answer! Getting the proper nutrition during pregnancy is easy if you’ve already been following a well-balanced healthy vegan diet, but you should be aware of increased needs for folic acid, vitamin B12, and vitamin D during your vegan pregnancy. 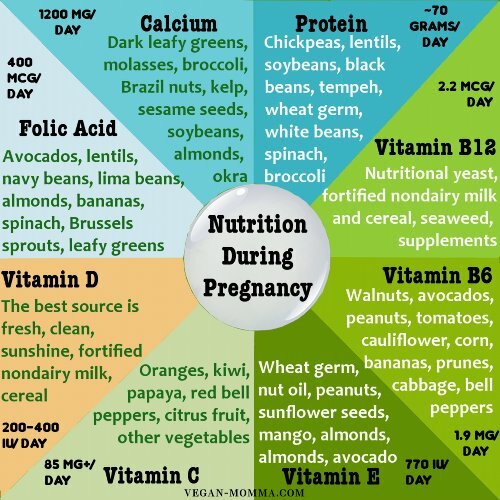 Here's a handy chart I made that shows the eight main vitamins, minerals, and nutrients you need to (lightly) monitor when you're pregnant. If you eat a vast majority of the food on this entire list, you probably are doing really well at maintaining a balanced vegan diet and getting the necessary nutrition during pregnancy. One of the biggest worries people have about the vegan diet is the supply of calcium, whether they’re pregnant or not. I’m not 100% sure how this myth became so prevalent, but I have to assume a good deal of it is from us all watching so many milk commercials as kids. We have to remind ourselves that those commercials are made by members of the milk industry, and they are doing an amazing job at selling us. Not only do we not need cow’s milk, but it’s actually hurting us. Animal protein leeches calcium from our bodies, so while it may be true that there is more calcium in cow’s milk, your body is not actually absorbing it all. You will absorb more calcium from plants. What your mother always said about calcium is true; it helps build and maintain strong bones and teeth, and helps with circulation, so it’s critical during pregnancy. Calcium is abundant in plant sources, so vegans will have no trouble getting plenty of calcium during pregnancy. Great sources of calcium include nuts, seeds, broccoli, soybeans, greens, figs, apricots, molasses, and tofu (depending on the brand). Folic acid is super important for proper nutrition during pregnancy, and especially important very early in pregnancy. During the first six weeks, your body is hard at work developing your baby’s spinal cord and brain, so any abnormalities would develop early. If you have a deficiency in folic acid, your baby has a higher risk of being born with spina bifida, hydrocephalus, or other neurological disorders. All doctors recommend that if there’s any chance you might become pregnant that you ensure you are getting plenty of folic acid in your diet, and possibly taking a supplement, just to be safe. The normal RDA for folic acid is 180 mcg, and before and during pregnancy that amount increases to 400 mcg daily. Check to make sure your prenatal vitamin supplies enough folic acid and make sure you consume plenty of plants high in folic acid. There are plenty of plant sources of folic acid such as avocados, lentils, navy beans, lima beans, almonds, bananas, spinach, Brussels sprouts, romaine lettuce, and other dark leafy greens, and learn about the health benefits of peaches. While we’re talking about folic acid, let’s get right to vitamin B12. It’s really important that when you are taking higher doses of folic acid that you also take vitamin B12 because high amounts of folic acid mask the symptoms of vitamin B12 deficiency. Confusing? The reasons aren’t that important to know, just make sure your vitamin has both. Vitamin B12 deficiency is another of the mythical worries that non-vegans assume are huge concerns in the vegan world. While there are few plant sources that naturally contain vitamin B12, some are now fortified with it, and it’s easy enough to take a B12 vitamin once a week. Although it’s difficult to become deficient in vitamin B12 (your body stores it for between 5 and 20 years), the deficiency really messed with your body, so it makes sense to supplement it, especially during pregnancy. For proper nutrition during pregnancy, you need to take in 2.2mcg of vitamin B12, up from 2mcg when you’re not pregnant. Plant sources of vitamin B12 include tempeh, miso, alfalfa sprouts, bean sprouts, turnip greens, lettuce, peanuts, peas, nutritional yeast, well water, and fortified cereals and milks. The last of the highly recognized fears of being vegan and pregnant revolve around getting enough protein. You’ll field this question OFTEN as a pregnant vegan, so it’s best to school you in the hard facts so you’re armed with answers. Proteins are essential for humans, and make up a large percentage of our body weight. We are born with nonessential amino acids and need to take in the eight other essential amino acids through our food. The big concern about protein comes from the fact that animal sources contain all of those eight amino acids in one spot. While a few plant sources also have all eight, most have some or the other, so you need to eat a variety of plants in order to get all those essential amino acids. But, haven’t we been saying to eat a variety of fruits, vegetables, beans, grains, and nuts all along? As long as you’re doing this, you will absolutely get plenty of protein not only to cover yourself, but to ensure your baby is incredibly healthy. Years ago there was also a rumor that you needed to eat all eight essential amino acids in one meal in order to fully get the benefits of the protein. This habit, called protein combining, freaked a lot of people out and pushed them away from veganism. We now know that it just isn’t true. As long as you eat those amino acids throughout the course of your day, you’re doing fine. In fact, research now shows that eating too much protein is detrimental to your health. It puts a strain on our kidneys and liver, and any excess protein is stored as fat. Those strains on the body put us at higher risks for developing cancers and other degenerative diseases. There are many amazing sources of protein in the plant world, some of them include: chickpeas, soybeans, lentils, tofu, tempeh, white beans, black beans, lima beans, ALL BEANS, spinach, broccoli, peanuts, potatoes, wheat germ, and even carob. Vitamin B6 is a female’s best vitamin friend. It helps to balance our hormones, regulate our moods, and redistribute our water levels, working as a diuretic. It can also help alleviate some symptoms of morning sickness. Score! When you are pregnant you will need more vitamin B6 than usual because of the higher amounts of estrogen in your body. It’s incredibly easy to get vitamin B6 from plant sources, and some good options are: walnuts, peanuts, bananas, soybeans, prunes, avocados, cabbage, corn, tomatoes, bell peppers, and cauliflower. Vitamin D is really important for your growing fetus as it helps form the bones and tissues of your baby. You need to have sufficient supplies of vitamin D in order for your body to absorb adequate calcium. 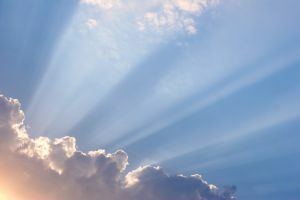 Vitamin D is available in some animal sources like eggs (at least, in healthy animals that aren’t factory farmed or fed unnatural diets, so in very, very few nowadays), in synthetic form added into milks and cereals, and from the sun. Researchers are finding nowadays that most people (we’re talking 70%) are deficient in vitamin D.
I think this came about because we have all been taught to apply sunscreen any time we’re in the sun. In reality, you need about 15 minutes of sunshine each day on your hands and feet WITHOUT sunscreen. This is even more important for people who have naturally darker skin as their bodies are built to receive more color from the sun. Of course, you should never allow yourself to burn. You can also get vitamin D nutrition during pregnancy from a vegan prenatal vitamin. Vitamin E is incredibly easy for vegans to achieve from plant sources. It works as an antioxidant and helps to release free radicals from collecting in your body and creating cancers. You only need a slightly increased amount of vitamin E during pregnancy. For good nutrition during pregnancy, include wheat germ, nut oil, vegetable oils, sunflower seeds, almonds, avocado, mango, and peanut butter for good sources of vitamin E.
Vitamin C is another important factor in a healthy pregnancy. Vitamin C helps to develop your baby's immune system, develop collagen in bones and skin, and prevent preterm labor. You can get plenty of vitamin C by eating grapefruit during pregnancy, oranges, papaya, red bell peppers, kiwis, and other fruits and vegetables. Overall, if you eat a well-balanced vegan diet full of whole grains, beans, vegetables, fruits, and nuts/seeds, you will have no problem getting the proper nutrition during pregnancy. It can only help to add in a vegan prenatal vitamin to make sure that if you have a bad eating day, you're always covered.